A great place to start is my bio at 5th Element Fitness. I have a husband, a dog and a weightlifting platform in my garage. 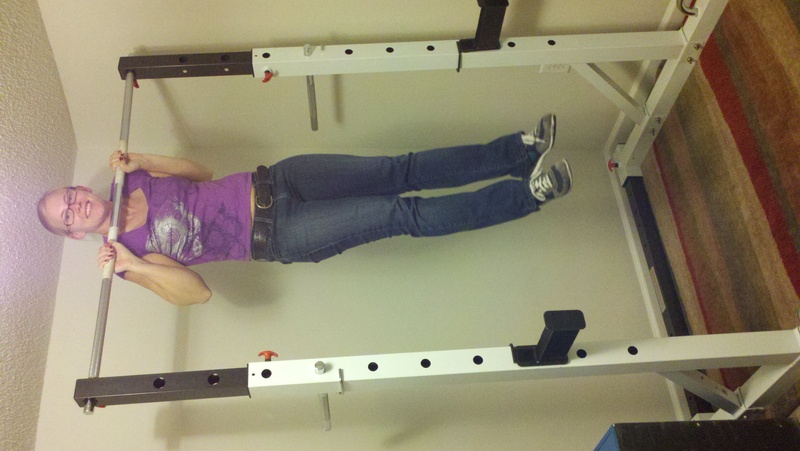 I used to have a pullup bar in my guest bedroom. My motto to “try anything once” has led me to run a marathon, lift in an Olympic weightlifting meet, throw heavy stuff at the Highland Games, fall over attempting yoga poses, submerge my head in mud puddles at a few mud runs, run-bike-swim to finish a sprint triathlon, and participate in the sport of fitness. The military dictates the when and where of my life, via my husband, but I try to be firmly in control of the how, what, and why. If you want to see what I’m up to in the gym currently, you’ll have to sign up for the Starting Strength forums to view my workout log. Several years of CrossFit workout logs are on my personal blog, ceewiss. If you’re interested in reading more of my thoughts on being a “radical woman”, check out the Q&A I did with Steph Vincent of Radical Hateloss (way) back in January 2010.